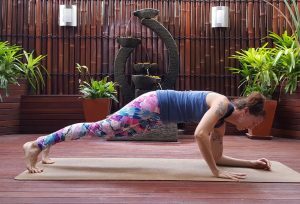 I spend a lot of time contemplating core strength and trying to find ways of both deepening and improving my awareness of moving from my core. The main reason for this is two fold. Firstly, I really think the more awareness we have in movement, the more we open up the door to being more immersed in the whole experience. 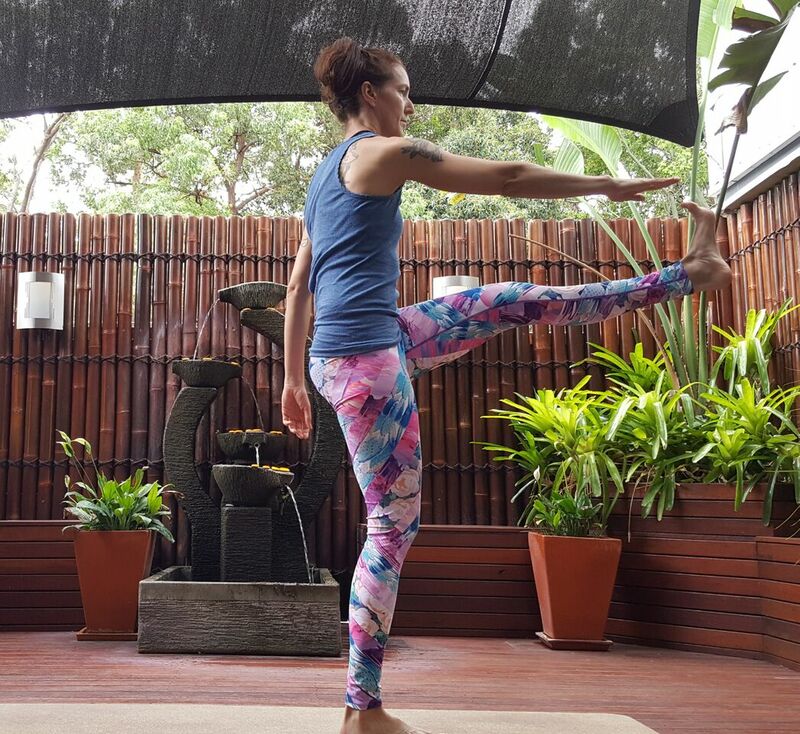 We begin to sense into how all of our parts are connected and by moving for example, our leg or our arm, we can actually do that by thinking of the leg or arm as being a part of a greater whole, connected to our centre and moving from that place. Secondly, I have found core work really helpful for healing chronic lower back pain I’ve had over the years. It’s helped me to find a very key piece to the back pain puzzle for many people of learning how to connect the front of the body to the back of the body, again integrating everything into a greater whole, so some of the more vulnerable and mobile parts of the body, for example, the lower spine around L3, L4 and L5 do not get over used, while other parts are under used. That being said, I wanted to share three simple exercises that are some of the most effective ways of developing a stronger and more aware core. These are exercises I do regularly and have found really help with not just strength, but balance and confidence as well. Firstly, lets start by defining what I mean by core. I think of the core as everything related to our centre. This includes our back body, abdominals, side body, pelvic floor, hips and solar plexus area. 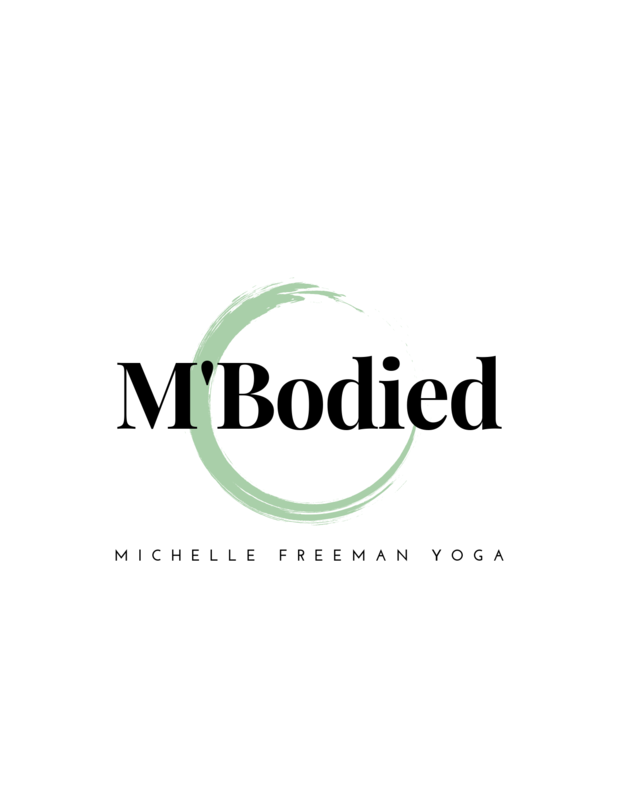 Our core when strong and supportive, should be able to support us in any position, whether we are turning to the side, coming into a backbend, or bending over to pick something up off the ground. 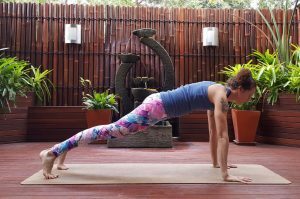 For this reason, I’ve included all three of these exercises to intentionally move you off centre. This helps to target, more subtle secondary core muscles and also forces you to stabilise in somewhat awkward positions which is very effective way to build core strength. Before starting these exercises, I recommend warming up for a few minutes either by walking or jogging in place, or anything that helps you to feel warmed up. This is a fantastic exercise that actually will get your heart pumping and strengthen not only your core, but legs and hips as well. I call this a squat because it will actually feel like a one legged squat in how it works your legs. It’s excellent for ankle, knee and hip strength and mobility and helps with better balance. Remember everything is connected and squatting is one of the best ways to develop core strength, especially when you work bilaterally as is the case in this exercise. 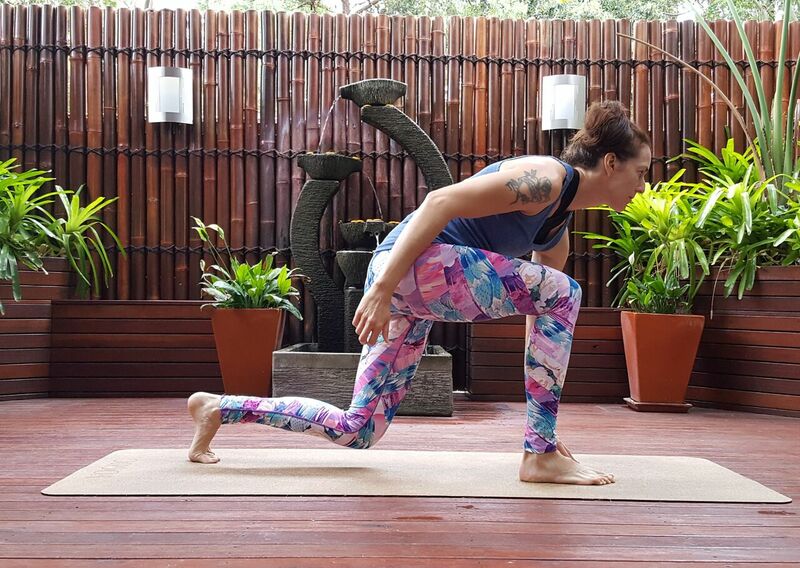 This exercise basically involves a one legged lunge position. Notice in the photos, I’m on my back toes which is needed so you can spring forward into the second position. For the second position, level one is bending the knee towards your chest as shown in the top photo on the right. Level two is kicking the leg straight out in front and trying to touch your toes or shin. This exercise is done fairly quickly going back and forth between the starting lunge and knee or leg raise. Try starting with 30 seconds per side. This is a very effective way to gain strength quickly throughout your whole body. 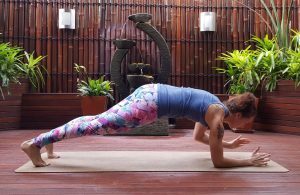 If you are not used to holding your body weight with your arms, go slowly and start with just holding a basic forearm plank position. Make sure you maintain a strong core by lifting your lower belly up and drawing your front floating ribs in. If you sag in your lower back, try the beginner forearm plank, until that’s comfortable for you and then build up to both knees lifted. You can build up to the transitions between high and forearm plank. 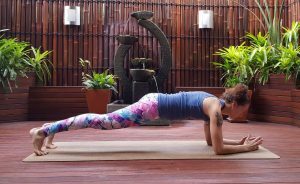 To start working on the transitions from high plank to low, simply start in high plank and then lower one elbow down at a time, then press back up to high plank one hand at a time to finish in high plank. Repeat this, alternating sides for 30 seconds if possible. Slowly lower one elbow at a time and press back up. Try doing as many as you can for 30 seconds, making sure to alternate sides. This exercise targets the side and lower abdominals. 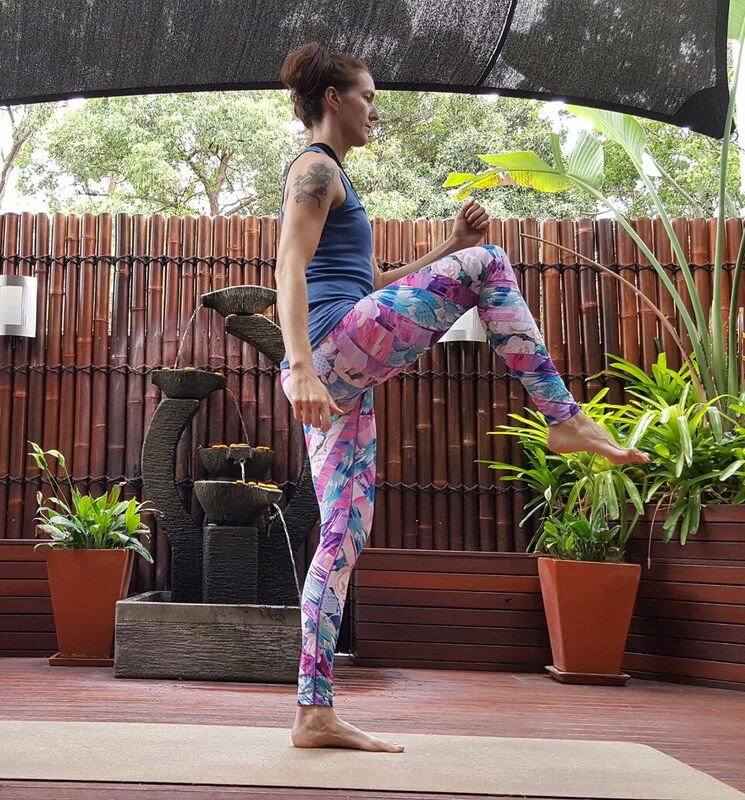 It can be scaled back for beginners by not bring the leg up to centre each time as shown here, but by lifting one shoulder and elbow off the ground at a time to touch the opposite knee. 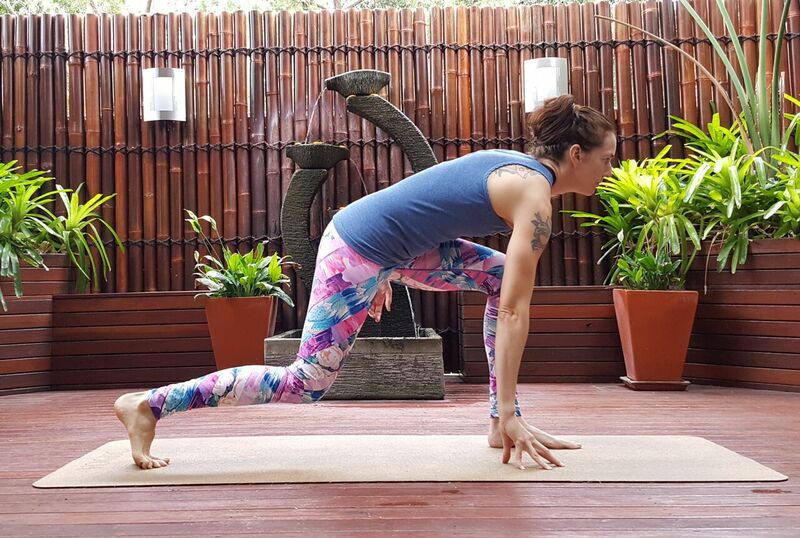 Try to move slowly and breath with each movement, exhale as you lift up and inhale to lower down. You can do this for repetitions maybe try 10 on each side to start, or do as many as you can for 30 seconds. Try repeating this whole circuit for a total of 2-3 rounds regularly and you should see some big changes in your core strength.